Perga (Greek: Πέργη Perge, Turkish: Perge) was an ancient Greek city in Anatolia and the capital of Pamphylia, now in Antalya province on the southwestern Mediterranean coast of Turkey. Today it is a large site of ancient ruins 15 kilometres (9.3 mi) east of Antalya on the coastal plain. Located there is an acropolis dating back to the Bronze Age. During the Hellenistic period, Perga was one of the richest and most beautiful cities in the ancient world, famous for its temple of Artemis. 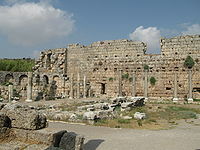 It also is notable for being the home of the renowned ancient Greek mathematician Apollonius of Perga.